The best HR Software but better. Simplify your procedures with CommonOffice's HR information system by having your own custom HR Portal. Our software allows you to quickly and securely organize your data and access all of your HR applications. 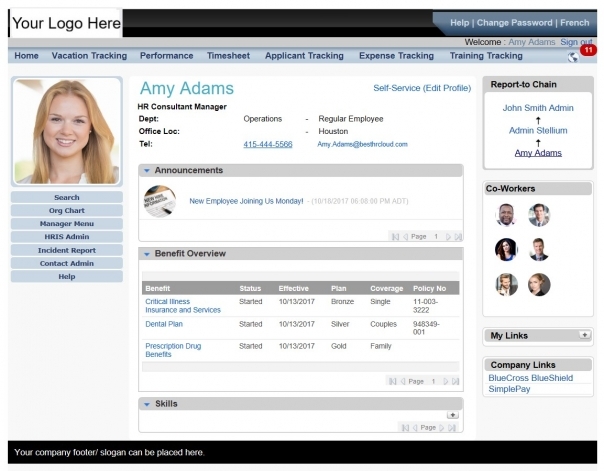 CommonOffice HRIS is interactive and easy to use for all of your employees! With Employee Self-Service, multiple levels of views, fully customizable, mobile apps, and amazing reports, you will be saving major time and money! With real-time reporting, you can generate and download current data about your employees so you do not have to worry about inaccurate or old data. Generate more than 100 customizable reports when you need it. No matter the size of your company, CommonOffice HRIS will be sure to cater to all of your needs. Whether in line for lunch, in a taxi, or half way around the world, keep track of your requests with our CommonOffice HR mobile app. Are you wondering if an HRIS system is right for your business? The first steps are always scary, but there are many advantages to consider when choosing CommonOffice. Our HRIS system allows you to centralize all of your data points, allowing you to generate more insightful reports and analysis. The most important advantage is that CommonOffice HRIS helps professionals like yourself spend less time on managing spreadsheets and more time on more important tasks.